BOISE, Idaho -- With the threat of wildfire danger increasing rapidly, state and federal land management agencies will implement Stage 1 Fire Restrictions on all lands within southwest Idaho effective Aug. 3, 2018, beginning at 12:01 a.m. Fire restrictions limit certain activities in the outdoors to decrease the chance of any preventable fires in the designated areas. · Ada, Canyon, Gem, Payette, Elmore, Boise, Valley, Washington counties and Owyhee County west of Bruneau Canyon. · Within Washington County, all Bureau of Reclamation lands surrounding Mann Creek Reservoir. · Within Valley County, all Bureau of Reclamation lands surrounding Lake Cascade. · Within Elmore and Boise counties, all Bureau of Reclamation lands surrounding Arrowrock and Anderson Ranch reservoirs. · All of Ada, Canyon, Gem, Payette and Washington counties. Portions of Boise County including the administrative boundary of Lucky Peak Lake to Arrowrock Dam, south shore of Arrowrock Reservoir and that portion of Elmore County that lies south of the South Fork Boise River to Anderson Ranch Dam, south along Anderson Dam Road (FS Rd 134) to Highway 20, east on Highway 20 to the Elmore/Gooding County line south to Interstate 84. · The Treasure Valley Restriction area is bounded by the Idaho/Oregon boundary to Oreana then follows the Bachman Grade to Triangle and continues east-northeast of the Owyhee Front to the Bruneau River. The northern boundary begins near Weiser, Idaho and follows Highway 95 to Indian Valley, then generally follows the Little Weiser River to the Payette and Boise National Forest boundary lines. 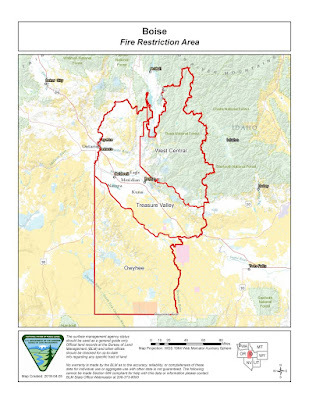 · Boise National Forest, Boise District BLM and State and Endowment Lands within Elmore County, Boise County, and Valley County to include all Bureau of Reclamation lands surrounding Lake Cascade. From the point where the Boise National Forest boundary intersects State Highway 20 near Dixie following the Boise National Forest boundary west and north along the ridge of the Danskin to Boise Front foothills and extending north encompassing the Idaho Department of Lands to its intersection back with the Boise National Forest boundary near Sage Hen Reservoir. The far northern boundary includes all Boise National Forest lands, excluding the Frank Church River of No Return Wilderness. All lands north of Sage Hen Reservoir including Tripod Mountain and West Mountain within the North Fork Payette River drainage north to near Tamarack Resort. · All of Owyhee County west of the Bruneau Canyon. · Building, maintaining, attending or using a fire, campfire or stove fire except within a designated recreation site within a permanent concrete or metal fire ring, or on their own land within an owner-provided structure. · Smoking, except within an enclosed vehicle, building or designated recreation site, or while stopped in an area at least 3 feet in diameter that is barren or cleared of all flammable materials. · Persons with a written permit that specifically authorizes the otherwise prohibited act. · Persons using fire fueled solely by liquid petroleum or liquid petroleum gas (LPG) fuels. Such devices, including propane campfires, may be used only in an area cleared of flammable material. · Persons conducting activities in those designated areas where the activity is specifically authorized by written posted notice. · Any federal, state or local officer or member of an organized rescue or firefighting force in the performance of an official duty. · All land within a city boundary is exempted. · Other exemptions unique to each agency. Fire managers are asking the public to be extra cautious when spending time in the outdoors. As a reminder, fireworks are prohibited on state and private forestland and rangeland during closed fire season (May 10 through Oct. 20), and on public lands, roads and trail in Idaho all times of the year. With the fire season well underway, the placement of these restrictions is intended to keep visitors to public lands safe as well as prevent the catastrophic effects of wildland fire. If you are planning a visit to public lands in these areas, please check with the Boise National Forest (www.fs.usda.gov/boise), the BLM Idaho (www.blm.gov/idaho), or the Idaho Department of Lands (www.idl.idaho.gov) websites for the latest information or visit www.idahofireinfo.com.